WordPress comes with the ability to sort your content into categories, tags, and taxonomies. One of the major difference between categories and tags is that categories can have subcategories or child categories. In this article, we will show you how to add categories and subcategories in WordPress and how to get the most SEO benefit out of categories. Categories are a powerful tool and can be used not only to sort your content, but to also develop a proper site structure that is meaningful and semantic. Before moving forward, we recommend you to read our guide on categories and tags. It will help you understand how categories are different than tags, why they should not be confused or mixed up, and lastly how to properly use categories. Once you have read it, come back here and we will continue. Let’s suppose you are creating a travel website for different destinations around the world. 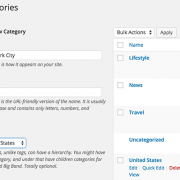 You may want users to be able to find articles by city and by country as well. 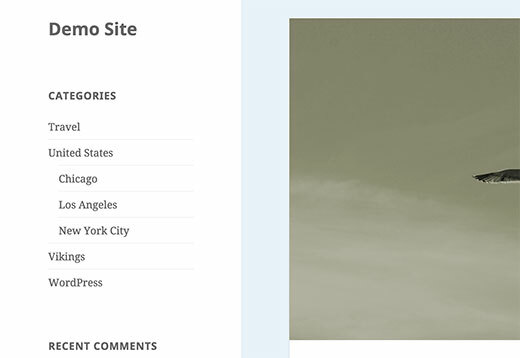 For example, you can add United States and then post articles for New York City, Los Angeles, Chicago, etc. This is where you can utilize child categories. United States would become a parent category, and cities can become child categories. It is important to note that a post filed under a child category does not need to be filed under parent category. For example, if you assign a post New York City as category which is a child category of United States, then you are free to choose whether you want the post to be filed under both or just the child category. If you choose to file a post under the child category but not under the parent category, then your post will appear only on the archive pages of child category. This particularly helpful when you want to avoid duplicate content. Let’s suppose you have created a parent category United States and it has only one child category, New York City. Now if you file a post under both parent and child categories, then the archive pages of both categories will be completely identical. 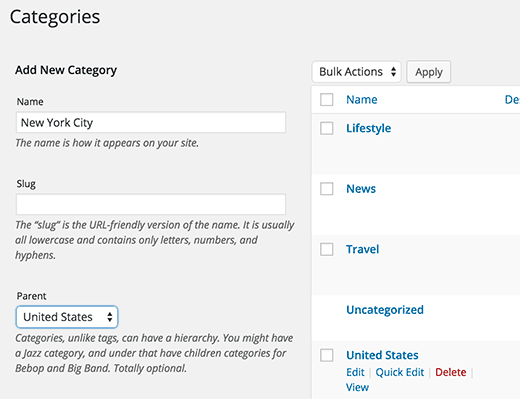 Having said that, let’s take a look at how to add categories and child categories in WordPress. You can add a new category in WordPress when writing a post. On the post edit screen, scroll down to the categories meta box and click on Add New Category link. You can also add a new category without editing a post. Simply visit Posts » Categories page and add your new category. This method is particularly useful, if you want to create all your categories before adding content. You can edit child categories the same way you added your parent categories. On the post edit screen, scroll down to categories section and click on the Add New Category link. This will show you text field for adding new category name and a dropdown menu to select the parent category. Similarly, you can also visit Pages » Categories page. Add the name for your child category and then select the parent category from the Parent dropdown menu. If you are using SEO Friendly URLs, then your child category URL will look like this. This is much more meaningful and helps search engines and users understand what your page is about. You also get a chance to add keywords into your URL, Keywords help people find content on search engines. 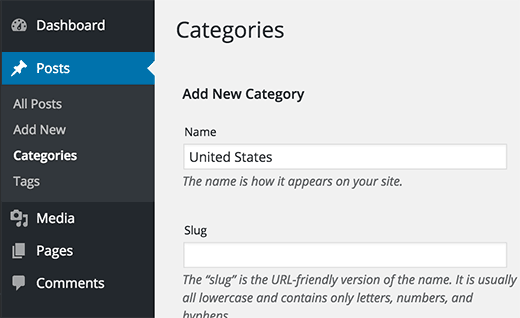 Your WordPress theme will automatically show the categories for each post. To display all your categories on your blog’s sidebar, you need to visit Appearance » Widgets page. Drag and drop categories widget from the list of available widgets to a sidebar. 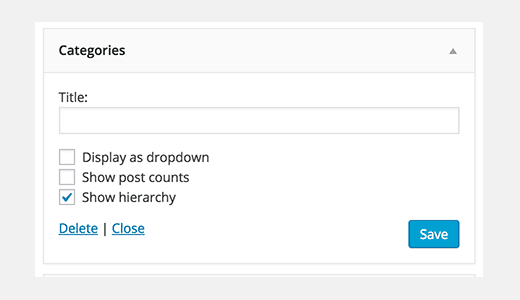 In the categories widget’s settings, check the box next to ‘Show hierarchy’ option and click on the save button. Visit your site and WordPress will show your categories with child categories aligned under the parent category. 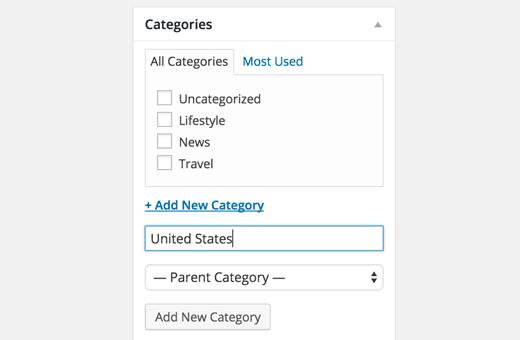 We hope this article helped you learn how to add categories and child categories in WordPress. You may also want to take a look these most wanted category hacks and plugins for WordPress. Thank you for the tutorial. It was clearly written and I solved my category/subcategory issues within 5 minutes. Hi I need help.. I have accidentally click on make a default.. How to undefault it back? 2)If we select one category the related subcategories should be displayed in subcategories feild. That is the most basic example of many to many relationship inside categories. One Category with multiple parents. Unfortunately WordPress is a pile of garbage and till this date this feature is not available. I don’t want all of my posts to show when i click on the parent. How do i go about fixing this? I only want to see the posts directly placed in each category and then list out each sub category just like you would in using Windows Explorer. I’m helping a friend switch update their website, and upon investigation they built it mainly from categories and sub-categories, with only four (unfinished and unlinked) pages and the reading setting as show recent posts, instead of having a static homepage. The main menu displays categories with sub categories highlighted underneath. My question is, what’s the best way to update the site, by adding a static homepage and other primary pages for the posts to be listed with without messing with the overall organization of the content? How can we add a third level of subcategory in Woocommerce ? Hello, awesome site. Thank you you have helped me to build my website. I have question hoping you can help – is there an plugin to place small images left side of post summaries on landing page.? I have looked and searched and even paid for a plugin that did not operate. Any help would be great. Very helpful like all your tutorials are. I always come here to learn the best practices as well as great plugin resources. Thanks for this tutorial. So… what is a sub-category good for? I can just have “United States” and “New York” — both as categories, and simply drag “New York” under “United States”. They’ll be displayed the same, as category / subcategory, only that they’re both categories. I can choose if an article goes to both, or just one of the categories. So, what is the use of having a subcategory? Subcategories allow you to add subtopics to a category. An article, filed in a sub-category is also displayed in the parent category. However, an article filed in a sibling category will not be displayed on other sub-categories that are also part of the same parent category. Duplicate content is the major issue when assigning posts to both parent categories and child categories. For example, I want the same post to show up under “united states” parent category and “New York” child category. However I need more than 1 post in each child category to avoid duplicate content. The problem occurs when you have a menu or website navigation made of categories. You have to wait until the blog is big enough to have a few articles in each sub categories to make a proper menu. Is there a way around this ? It shouldn’t be a problem. The url of the page/post remains the same, it is mentioned in the category page and Google recognizes this, their bots are really intelligent To avoid it even better I suggest you install YOAST SEO, a free plugin, which is great for your SEO and they offer the option to avoid duplicate content from categories as well in the settings menu. I’ve been working on my website and for days I’m trying to figure out on how to work the sub menus on my two blog categories namely lifestyle and tv series- the 1st submenu is working out fine but the 2nd level up to fourth level- I can’t click it al all. Great article. This was a HUGE help! You explained how to get the child categories to show on the blog sidebar but how do I get them to show on the top bar as drop downs? To do this go to Posts -> All Posts. Next, select the posts you want to add to a category, click on the Bulk Actions tab, select Edit and finally press the Apply button. Once you do that, you will few options you can adjust for those posts. One of them is the Categories section. I am using category and subcategory, but they are not reflecting in my URL. is there any reason for that in wordpress. Please answer.. I would like my category pages to show the sub-category PAGES that belong to that post. Currently, my category pages are show the subcategory POSTS. I am not sure if the first option is better, since it is becoming quite long. What if you want the category’s to be going across the top of the page and not on the side? Thank you for this post. I understand the category and the sub categories you explained. There si something I want for the my website. I make a category for a course with the course name now for the sub-categories, say, I want books, audios, videos and flashcards also I want a page which shows all the books from all the categories I have on a single page. Same for the audios, videos and flashcards. Is that possible without duplication? Is it possible to have multiple subcategories with the same name? For example, to categorize counties in the United States as State -> County. I would like Mississippi -> Jackson but also Alabama -> Jackson. Jackson county exists in both states, but should be entirely unrelated. Any way to accomplish this? I add category per easy instructions above ( visit POSTS–add new category..) and the added show up to the right, correctly as far as i can see, but not on main page under categories. Impossible to get it there, only the default “uncategorixed” show up there. Really strange, as i need to use Kudani and make a post on distance, but it also seems to think i have no category….. Simply creating a category is not enough. You may also need to assign atleast one post to that category. By default, WordPress sometimes does not display empty categories. What if I want to display my 2 subcategories on their parent category page? I know that there is some sort of code, but where exactly should I paste this code, in the functions.php? Hiya, thanks for the tutorial. Any tips where categories overlap? For example my DIY site often features stuff made from wood but also repairing or maintaining stuff made from wood. Do I categorize ‘wood’ or ‘repair’ / ‘maintain’. Sometimes wish I had a needle narrow skillset lol! Is there a limit to the amount of categories enabled on word press? I have a large amount of subcategories and wordpress won’t allow me to add anymore, it seems to just boot an old category out in order to make space for the new one? Now when I create a post I assign Parent & child categories because I am using ajax search to filter the result on hierarchy based. I also select one of those parent categories as well : Apple, Microsoft or Other. Now I have a search box where I sort the result based on country city or town. I would like to have a one more search box where I could sort based on Apple, Microsoft or others where once I select apple then it should display Australia -> NSW -> Sydney. Its like country (parent) category will be a child category in this search. Take a look at SearchWP plugin. It has a taxonomy filter that might work for your scenario. Country is the ultimate parent category I would like to have. Then I would like to display either all the hotels or Car Rental in that particular city. So basically countries will have both hotels and car rentals but I would like to display hotels only in Sydney if user decided to display hotels only or car rental. A category will not appear on your site until you publish a post in that category. Are the categories you mention in this post only applicable to POSTS, or can categories be added for PAGES as well? I don’t see an option for creating a category for PAGES. By default pages cannot be categorized. See our guide on the difference between posts and pages. 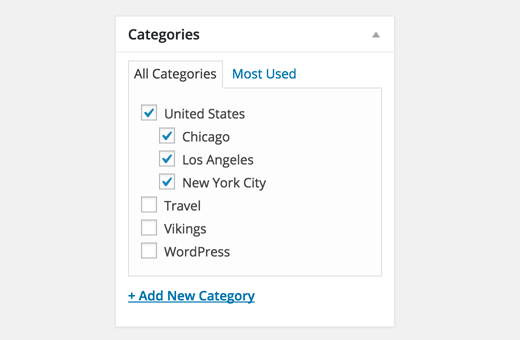 However, you can use a plugin to make categories and tags available for pages as well. I really needed this tutorial! Thank you so much for making it so easy to understand. I have added another sub category to an existing list and it does not show up on the blog page? Thanks A Lot For This Aricle,It Works! Yes. When adding a category you should be able to see an option to choose its parent category. i have to add more than 1 sub-category in a parent… how can i? Many WordPress themes actually come with built-in support to display sub-menus under menus. Go to Appearance -> Menus and add a subcategory just below its parent category. drag the subcategory to your right it will appear a little idented under the parent category. Save your menu and preview your site. On the front end if your subcategory does not appear in a sub menu but instead appears slightly indented below the parent category, then it is likely that your theme does not handle the display of submenus like you want. There are plenty of WooCommerce themes which support submenus you can check out their demos until you find the one that displays product categories in menus like you want. I have a site but im using a woocommerce, im not sure whether this is the right topic or not but heregoes. but in 1 categories (WINDOWS), can i do that? i mean like geez im sorry if you didn’t get it, but that’s my point here.. i really want my categories in 1 menu to be in different subs & products..
Hi just wondering your advice for bulk uploading of categories via cvs file. I want have computer brands as categories but thinking there has to be a quicker way than doing individually? Is it possible for a sub-category to apply to more than one parent? I.e. if the top level categories are Pizza and Calzones, ‘pepperoni’ can be a sub-category of both…but I don’t see how to handle that. Should ‘pepperoni’ be a tag instead? No it is not possible for a child category to have two parent categories. A workaround to this problem is to use custom taxonomies. We have a store site and used the tutorial to create a new category. In the admin functions it shows up in the lists. However the new category does not show up on the actual site. What am I missing? I’m startineg a blog and have created a Category and Sub-Category but the sub-category is not indented or anything to make it obvious it’s a sub-category, just doesn’t look right. Any advice? This is a styling issue in your theme. You would have to customize that. But why? You say over and over again “to keep your blog organised” Where and to who are you organising it? Does it create category pages and if so do we really want them? can we control how they look ? Can we disable category pages? We are organizing all the content on your blog into categories. 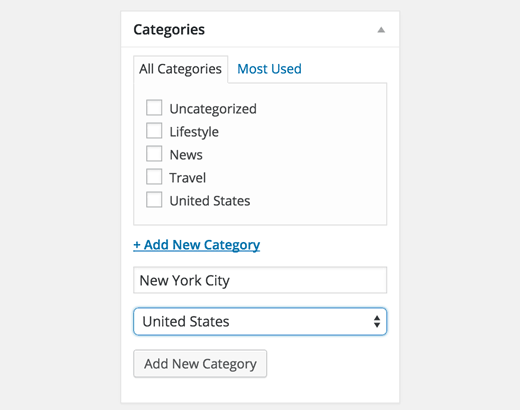 How to Add Categories to a WordPress Blog Site. Categories for your WordPress blog are not as easily found as they might be. You could … Add sub-categories. This is very helpful! THANK YOU! OK, so if I have a Fitness blog and I want a category at the top to be “strength workouts” and then I want the user to be able to highlight “strength workouts” and see a list of the exact strength workouts I have to share/offer, is that called a subcategory? What if I want like 15 of these sample strength workouts… or eventually 100’s of them… ? Is this how I’d go about it? Thank you!!! Parent category is called Entertainment, and sub-categories would be Film, Gaming, Music, Television etc. In your case you would have strength workouts as category, and then have each individual strength workout as a post. From what it sounds like, you don’t need subcategories at all.